The Choir Girl: Symphony Under the Sky! 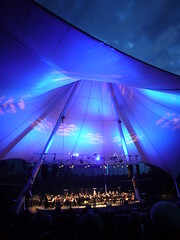 It's that time of the year again... the Symphony Under the Sky festival on labour day weekend September 2-5, 2011! More than anything else, this festival has become a mother-daughter tradition in my family now. However, it wasn't always this way. My friend, Nadia, actually introduced me to the festival and we started out by volunteering. We sold Häagen-Dazs icecream bars from the cart, ushered concerts, and helped run the Teddy Bear picnic hospital. I wasn't much help with the latter position since I didn't possess any sewing skills. Thus, I was unable to mend the teddy bears brought to me. I could only deal with imaginary teddy bear flesh wounds by applying a band-aid on the affected area. Since that time, my sister, Sarah, and I have managed to turn our mother into a Symphony Under the Sky convert. This was definitely an experiment because my mother is not the outdoorsy type. She always wondered why Sarah and I would willingly sit outside and feed the mosquitoes at summer festivals. The first year she went to Symphony Under the Sky we thought it would be better to get her a reserved seat, however, she quickly discovered that the reserved seats do not possess the hammock-like comfort of a lawn chair. After that realization, we went to Canadian Tire and purchased some Hawaiian fabric lawn chairs. Oh, so classy. We've never looked back since. Year after year you can see us on the grass seating area lounging with our Harry Potter fleece blanket and tea thermos. It's also the only time of year when my mother indulges in western festival luxuries like jalapeno cheddar smokies and mini donuts. Mozart, Handel, and Brahms... what's not to love? After the traditional playing of "O Canada," which signals the start of the festival, the program items for the evening will include: Mozart's "Concerto for Flute and Harp" showcasing the talents of the ESO's very own Elizabeth Faulkner and Nora Bumanis, Handel's "Water Music," and Brahm's "Second Symphony." A lovely way to kick off the festival with some symphonic classics. A concert filled with Broadway classics from Andrew Lloyd Webber to Sondheim. Definitely a must-see if you're a Broadway music lover! It will also be an interesting concert since Strathcona Highschool's Les Misérables cast will be performing pieces with Edmonton-born Broadway singer, Susan Gilmour. It will be a lovely afternoon filled with music from West Side Story, Carousel, Phantom of the Opera and others. By far my favorite evening out at the festival is the Hollywood Classics evening. There's just something magical about hearing the music from Hollywood movies in the darkened park while holding a hot beverage. The audience can expect to hear music from old Hollywood classics such as E.T. and the Wizard of Oz to modern day releases such as Pirates of the Caribbean and Batman. The Saturday night concert is always packed and for good reason. The Sunday night performance is definitely the "Canadiana" evening out of the festival. This year it showcases the talent and tunes of Ian Tyson. His songs will include "Four Strong Winds" which is an Edmonton Folk Music Festival anthem, "Somewhere in the Rubies", "Love without End" et al. His charming cowboy twang is sure to ensnare the hearts of audiences that evening. Plus, I'm sure he'll wear his cowboy hat on stage. 1. Sarah Ho playing Gershwin's "Rhapsody in Blue"
2. Andrew Reid premiering his debut piece "Echoes of Time"
This year's Symphony Under the Sky holds the promise of great music and soloists. If you haven't already got your ticket(s), I'd advise you to purchase them now since the shows have a tendency to sell-out. This festival really is the best way to spend the last festival weekend in Edmonton. All ticket details for weekend passes as well as individual shows can be found on their website. Prices range from $20-$39 for individual adults and $82-$125 for adult passes (depending on performance and seat location).